As much as we bow to the sensei whenever possible, we think he got it wrong when it comes to this sky high Mandalay Bay restaurant, hovering (but not revolving –whew!) 64 floors above the Las Vegas Strip. That setting is one of the most dramatic of any restaurant anywhere in the world, and from the decor to the grub that shows up on your plate, we think this is one of very few joints in the world (the others being the Jules Verne Restaurant in Paris and Pierre in Hong Kong, where the food matches the view. We tried to sneak in this past Monday night (just to update ourselves on the cuisine), and were seated in a flash as a single. 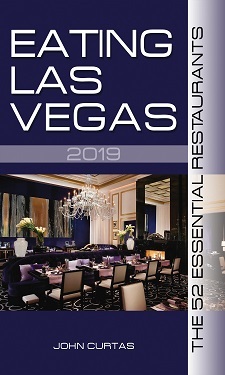 The plan was to sample the $65 three-course special menu (FYI: All restaurants in Mandalay Bay now have them — see my Facebook pics of earlier this week), and slink out before they could give me the complete, intensive care, we-know-you’re-a-critic routine. That plan lasted through our second sip of the bright, tart, tomato gazpacho amuse (bread, garlic, tomato, cucumber, Tabasco, sparkling water blended and given a shot of CO2) served in a tiny glass rimmed with lime salt — a nice way to get the salivaries started — and before ELV could butter his (excellent) bread with their (equally excellent) “peanut” butter, he was surrounded by waitrons, somms and one of his favorite food guys: Bruno Davaillon. Davaillon has been top toque here almost since it opened in December 2004, and he and his open-kitchen crew churn out hundreds of covers on a busy night. By the time we left at 8:00 o’clock (on a Monday night), the place was jammed. Manager Pascal Desvaux, a Joel Robuchon veteran, told us they had one of their most successful weekends ever last week, and admitted that a good weekend will still have them turning the tables 2-3 times. So is the food as finely tuned and hand-crafted as that turned out by Guy Savoy and Robuchon? Of course not. But the cooking is solid and creative, and well-suited for a high-volume place that screams “dazzle factor” — but doesn’t want to provide too much of a challenge on the plate to the turistas. Cold lobster salad is such a cliche, you’ll be tempted to dismiss this one, but after one bite of the tightly composed disk — perched atop a vegetable mosaique, and accompanied by a thick lobster “vinaigrette” of intense lobster-ness — you’ll know you’re in the hands of top flight kitchen talent. Ditto the fish. We’ve eaten here at least half a dozen times and have never had anything but a perfect piece of pisces. Sure the filets are small, and expensive ($42-$48), but the flavor of whatever you’re tucking into — from diver scallops to Atlantic cod — practically leaps at you from the plate, with never more than one or two other ingredients humming harmoniously in the background. That cod — a simple, thick square surrounded by tangy brown butter, tiny crunchy croutons, and crispy fried parsley — might be the most memorable fish we’ve bitten into in ages. It tasted of rich, buttery cod, with every accent providing a pitch perfect note. Duck “a l’orange” — a fat slice of rare Maple Leaf duck breast and a cute, little confit of leg meat, is, once again, a tad small in the portion department, but probably the best way to appreciate this fatty fowl. Why pay $42 for it? Because it’s been hand-selected from an organic farm by Davaillon and corporate Executive Chef Sylvain Portay (a fellow with serious chops of his own in the gourmet food world), and the vegetables are likewise as pure as these things can get, and a team of chefs makes this food as fun and accessible as fine French food can get. In the past we’ve been critical of Alain Ducasse’s celebrity chef status as it relates to this place. While it’s true that Ducasse practically invented the concept of globtrotting chef — actually he did invent the concept — after considering our many meals on the premises, and how good they’ve been, we at ELV have decided that the big guy can show up (or not show up) as often as he likes. The food here is that good. Of course being what many consider the greatest chef in the world probably doesn’t hurt a bit when it comes to keeping your troops in line. ELV left a $40 tip for his comped $130 meal. Over the years however, he has dropped some serious coin in this place. * FYI: In keeping with the integrity and full disclosure for which he is known, ELV must confess that he has failed to score after springing for meals here, and thus, has failed to heed his own advice. I believe you, I believe! Might this be likely to be able to have yuor web blog translated directly into Greek? English is my own 2nd language.